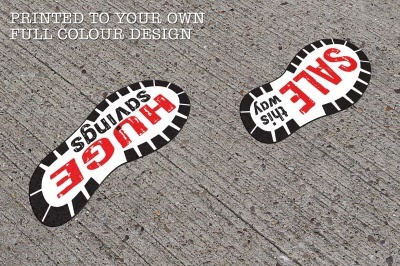 Grab your customer's attention with this Eye Catching, Outdoor Shoe Print Shape Floor Graphic, includes the wording 'SALE - This Way' and 'Huge Savings'. Change the text, colour or add your logo for FREE. Artwork requested via email once the order has been placed. Minimum Online Order Quantity is 5 Pairs. Durability of up to 12 months outdoor exposure subject to pedestrian foot traffic. Can't see what you were looking for ? Try one of the following links..! We also produce printed floor graphics, printed floor vinyl, printed floor stickers, footprint floor graphics, footprint floor stickers, shoe print floor graphics, shoe print floor graphics, paw print floor stickers, paw print floor graphics, wedding floor stickers, wedding floor graphics, directional arrow floor stickers, directional arrow floor graphics, safety floor stickers, safety floor graphics, christmas floor stickers, christmas floor graphics, splat floor graphics, splat floor stickers, standard printed floor decals, printing floor stickers, printing floor decals, printing floor vinyls, external printed floor stickers, external printed floor vinyls, internal printed floor graphics, internal printed floor decals, cut to shape floor stickers, cut to shape floor decals, cut to shape floor vinyls, short term floor graphics, long term floor graphics. TEL: 01384 264700 | FAX: 01384 264729 | EMAIL: sales@floorstickers.co.uk.